Our company has been successful in winning appreciation from the clients as one of the most prominent names in the trading of Metal Stamping Parts. Rim and Web are one of the important and critical parts of Brake Shoe used in the Drum Brake system. 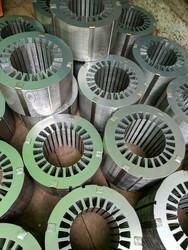 Rim and Web are produced through stamping process and then those are welded by the projection welding process. Rim and Web assembly is manufactured at CEPL for the drum brake systems assembled in FBMPL plants for Maruti, Toyota and Bajaj cars. Sheet metal stamping parts is the metal parts made by metal stamping. Most of our sheet metal parts are made of sheet metal. Sheet Metal Spare Parts are available in different specifications and can also be customized as per clients requirements. Our reputed entity is engaged in supplying Metal Stamping Parts. OUR COMPETITIVE ADVANTAGES: 1.Progressive Stamping, Presses Tonnage Range From 500T, 315T, 110T, 60T-45T High speed with high end ORIIMEC uncoiler, straightener & feeder. 2.In-house precision progressive stamping. We are manufacturer and supplier of Metal Stamping Parts, which are the metal parts that belong to hardware parts or metal accessories. Metal Stamping Parts includes OEM/ODM stamped parts, stamping parts with laser cutting, die stamping, CNC punching, CNC shearing, Welding, Bending & metal fabrications, etc We manufacture customized metal parts according to customers' design.